Reconstructing the Old House is as a touring exhibition, featuring artist’s who take architecture or the urban environment as a starting point. The approaches are multiple, some directly referencing architecture as an iconographic form, others sitting on the edge of fully adopting architecture as a theme, yet freely and wilfully plundering the territory for inspiration. The utopian pipe dreams of fantasy landscapes sit next to near-unclassifiable experiments in playful construction; mixed-media collages of synthetic ephemera alongside a purity and elegance that echoes modernist ideals. In essence, the architectural reference can be seen as a starting point for a broader investigation of process, material or idea. 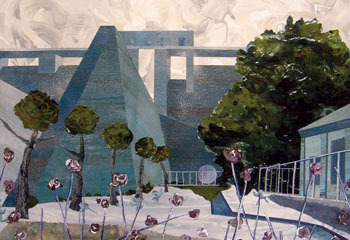 The highly subjective nature of the artist’s relationship to an urban context, and the diverse strategies that result, places the emphasis on the making of things - objects or images - and the relationship between two separate areas of construction: the artist’s studio or the man-made world outside. Following the exhibition at the Nunnery Gallery, the exhibition will travel to the Ruskin Gallery, Cambridge in October 2009. A catalogue will accompany the exhibition. Reconstructing the Old House is curated by Benet Spencer, and funded by Anglia Ruskin University. Generous support has been given by The Bow Arts Trust, the Nunnery Gallery and the Ruskin Gallery. Exhibition Discussion with artists and curator this Saturday 25 April at 2.00pm.